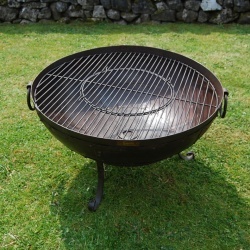 The Kadai fire bowl or Kadai fire pit is available in three sizes, 60cm, 70cm or 80cm diameter, it is also available as a Travel Kadai available in 35cm and 45cm diameter. 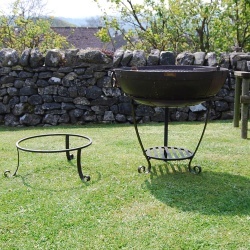 A choice of four stands is available, two high stands the 'Gothic Stand' and the 'High Wrought Iron Stand' (high stands are used mainly for cooking on) and two low stands the 'Tudor Stand' and the 'Low Wrought Iron Stand' (Low stands are used mainly for sitting around the when using your Kadai fire bowl as a Kadai fire pit). 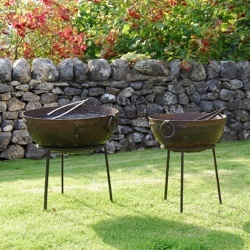 It can be useful to have one high stand for cooking and one low stand to move the Kadai BBQ fire bowl onto to create a Kadai fire pit. 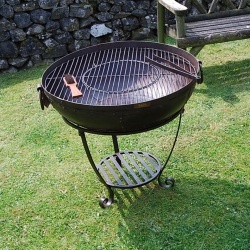 Take a look at the different stand options available below, the price includes a Kadai bowl, cooking grills, metal tongs for handling wood and charcoal and wire brush for cleaning the grills after use, the stands vary in diameter to fit the chosen Kadai diameter. 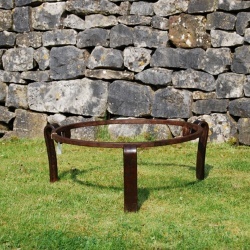 The Kadai barbeque fire bowl or Kadai fire pit has an attractive rustic look and can be used as both a versatile BBQ and a fire pit. 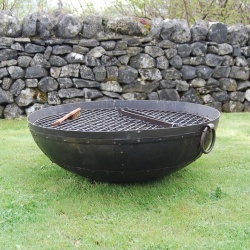 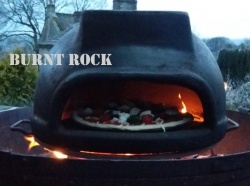 With a huge range of cooking accessories available you can cook anything on your Kadai firebowl. 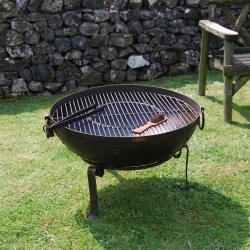 Once cooking is complete your Kadai BBQ can be turned into a delightful Kadai fire pit by simply removing the grills and adding logs, an attractive way of providing heat on those nights when you just want to stay outside and relax with friends and family. 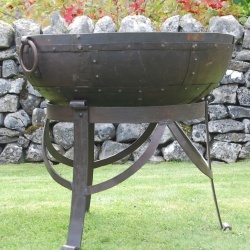 Built from recycled oil drums the recycled kadai barbeque fire bowl is made in India by hand from steel plates, each piece of steel is chiseled out from flattened recycled oil drums, and then shaped and riveted together to form a perfect fire bowl.